Man cave chairs. Recliners – our top picks. So you want your friends to come around and watch the big game. Sure, they say. Yet when they get there they find that there is nowhere comfortable to sit down. There are no man cave chairs in sight. Oh dear. What you have done there is make the classic man cave error. You have created a man cave that is devoid of comfy seating or is still in the construction phase prior to the delivery of said seating. You may as well go to the pub and watch the game on their big screen because your big screen has been rendered useless by every man on the planet. So before you send out invites and start wanting to show off your new creation, ensure the seating has been dealt with. You want comfy man cave chairs that will satisfy all your visitors for the entirety of a five day test match (that is the English sport of cricket and yes, it goes on for five days). The seating has to be in line with your fabulous full HD TV with nothing obscuring the view. Furthermore, you need to have sufficient table space within reach of the seating so that beer can be placed down with ease and chips can be grasped from the bowl without too much stretching. Get this right and your man cave experience will have your friends wanting more and more. Forget about the man cave chairs and you can forget about the your man cave. 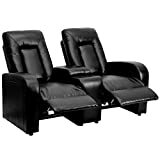 Recline in your favourite position with this budget recliner and ottoman set. The arms are nicely padded and the bases are wrapped in PU leather so as not to scratch the flooring (although they look ugly so i would recommend removing them). 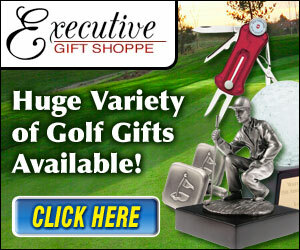 The ideal attribute to this particular set is that because of its budget pricing you can purchase more than one so your friends do not have to look upon you with envy when they visit your man cave. Sure, it isn’t made of real leather, but that is ok. It just means there isn’t an expensive fabric to get ruined by spillages. Overall this chair is comfortable but possibly a little low for some people. If you are excessively tall and you have bad knees then maybe this one isn’t for you. As man cave chairs go, the reclinability is pretty good and there is a stop that can be adjusted so that you can recline back to your preferred position without having to fine tune the angle each time. As with most online purchases this chair does not come assembled so you will have to do that yourself. If you are inclined to follow assembly instructions then they are clear and easy enough to follow. If you are relying on your intuitive man brain to put it together then you should have few problems. All tools required for assembly are included. If, when you have finished assembling the chair and you find a few left-over screws or nuts, do not worry. Either strip it down and start again or presume that they put too many in the box to start with (we advise the former and cannot be held responsible for collapsing chairs and spilled beer due to the latter). All in all these make for fine man cave chairs. They will not break the bank and are easy enough to clean with a wet sponge as no spillages will soak through the fake leather. They are a bit plastic looking and maybe aren’t great for those on the taller side but they seems to be sturdy enough. This luxurious leather man cave seating group will be a stylish addition to your man cave. 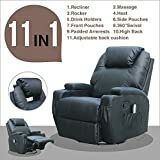 High back cushions with padded headrests, and deep pad over chaise reclining seats give the reclining chairs full body support, for the ultimate in relaxation as you watch men hitting balls in Full HD with your friends. Assembling the three-seater is relatively easy although you may need some help attaching the seats together. Instructions are clear for those that bother with instructions. For those that don’t, everything is pretty straight forward and self explanatory. The buttons for reclining are located to the side of the arm rest making for easy access. 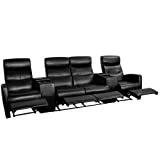 The reclining motion is smooth and easy and is suitable for all sizes so height is not an issue with this set. The head and neck section of the seats is adjustable making them very accommodating for all head and brain sizes. This is good news for the wife and kids who may want to watch big CGI explosions on TV with you. Whilst these chairs may feel a little hard and the leather a little coarse at the beginning, they will soon bed in as they are used over time. Another possible negative is that for the price (and it is a good price for what you get) the fear of spillages may unnerve you during the course of a big night with the boys. Just stock up on leather cleaning stuff just in case. All in all these make for three great man cave chairs if you can stretch the budget. As man cave chairs go, you would be hard pressed to find something better provided you want something that is easy to clean, is marked by your hockey team of choice and is under $800 all in. 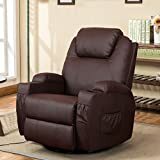 If you do not fit any of those criteria then see below for our best overall man cave recliner chair. These man cave chairs are constructed from high quality microfibre which makes them incredibly easy to keep clean. They are also stain resistant so there is no need to worry when things get out of hand. This recliner features the ability to rock and recline, allowing you to enjoy the game in complete relaxation. The plush arms and back cushions make this recliner extremely comfortable making afternoon snoozes in front of the golf easy and effortless. There is an An 8″ embroidered patch logo prominently displayed on the headrest and the team name logotype on the footrest. 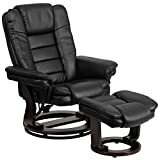 The recliner supports upto 350 pounds, accommodating men of all sizes and shapes. 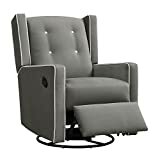 This is a USA made recliner so you do not have to worry about any pesky foreign company ripping you off (unless you are not USA based in which case it is made by a foreign company, although pesky it is not). Check out this officially licensed NHL recliner here. This chair swivels. This is good because if you have installed a massive 80″ TV then following the ball from one side of the screen to the other will not require use of the neck. It is also good for facing the bar area or the TV area without having to stand up and move the chair around. This recliner Has a foot rest that extends up with a lever on right side meaning it is manually controlled. But for less than $400 what do you expect? There are 3 pockets in which to put magazines, remote controls or empty beer cans in this chair (1 on the right side, 2 small in the front) and there are 2 cup holders for nursing beer (one on each side). An added advantage is the vibration and heat that this chair produces so you can be warm and massaged at the same time as watching Luke Skywalker discover the force. The chair can accommodate tall people as well as short people so there will be no worrying about your buddies’ comfort when they sit in it. The chair is very easy to assemble with or without instructions and really just requires plugging in to the wall for heat and vibration effects. All in all this is a great mid–budget chair and is our choice for one of the best man cave chairs you can buy for the money.